The FBI released this image of two suspects in the Boston Marathon bombing case early on Friday. 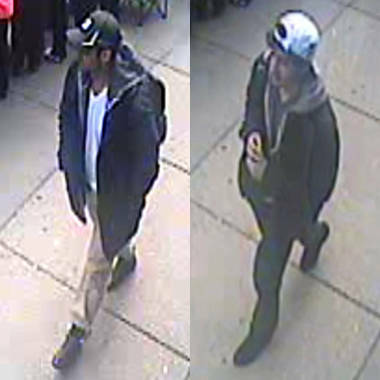 The FBI released new photos of two "armed and extremely dangerous" suspects in the Boston Marathon bombing early Friday. The pair — who were armed with explosives and guns — battled authorities in a Boston suburb until cops took one of the men into custody, and the other fled, sources said. Officials later said the the suspect taken into custody died. The suspect seen wearing the white baseball cap in the photos was still on the run, according to officials. Earlier, Boston FBI Special Agent in Charge Richard DesLauriers asked for tips, adding: "Somebody out there knows these individuals as friends, neighbors, co-workers or family members,"
"Though it may be difficult, the nation is counting on those with information to come forward and provide it to us. "We consider them to be armed and extremely dangerous," DesLauriers added. "No one should approach them...If you see these men, contact law enforcement." 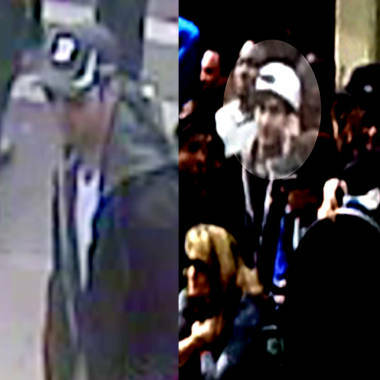 The FBI is asking the public's help to identify two suspects: one wearing a dark hat, and another wearing a white hat, who were both spotted carrying black backpacks near the scene of the bombing. One was observed setting down a backpack at the site of the second blast. NBC's Pete Williams reports. The images showed two men in baseball caps and dark jackets who were seen walking together through the crowd at Monday's iconic race. New headshots were released by the FBI at 2 a.m. ET on Friday. Law enforcement sources tell NBC News that unreleased portions of the surveillance video show the suspect in the white hat working his way out of the crowd, then raising his arm to apparently lift the backpack off his shoulder, but the view is obstructed by others. He sets the backpack down, working his way out of the crowd, then pausing briefly just before the first bomb explodes. He then calmly begins to work his way away from the second device, sources said. Seconds later, the second bomb explodes, and a terrible scene of carnage is apparent. Seconds after that explosion, a photograph now in hands of the FBI appears to show the suspect in the white hat moving away amid the smoke rising midway down the block behind him. Two sources said they are looking for repeat names amid the flood of calls to the investigators’ tip line to give them leads on who the suspects are. 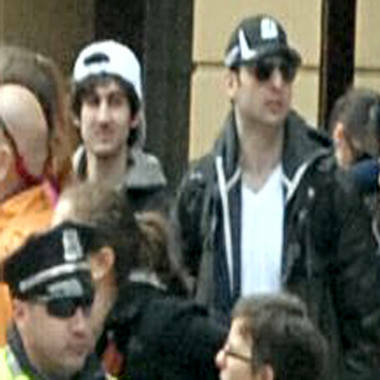 This image, which was released by the FBI early Friday, shows two Boston Marathon bombing suspects together. The man in the dark cap with a black backpack is being called Suspect No. 1. The other man, Suspect No. 2, is wearing a white cap backward and carrying a lighter-colored backpack. The public was asked to call a hotline, 1-800-CALL-FBI, with tips or visit the bureau's website, bostonmarathontips.fbi.gov. "No bit of information, no matter how small or seemingly inconsequential, is too small for us to see," DesLauriers said. "Each piece moves us forward toward justice." Following the release of the photos, people had already started calling in names. Investigators zeroed in on one of the men within the last day or so, he said. By examining photos and videos of the marathon crowd, they were able to identify a second suspect. These are among the photos of the suspects in the Boston Marathon bombing released by the FBI. "They appear to be associated," he said. Massachusetts Gov. Deval Patrick echoed the FBI's call for the public to help. "Pass along to law enforcement any information about the suspects that you may have," he said. The FBI released no other information about the probe, including the motive for the bombing, which killed three people, including an 8-year-old boy, and wounded 176. Investigators are casting a wide net for clues. The FBI was canvassing hobby stores in the Boston area to determine whether electrical components in the bombs were bought there, NBC News learned. Forensic work from the blast zone has helped authorities identify major components of the bombs. They were housed in metal containers — at least one an everyday kitchen pressure cooker — and studded with metal, including fine nails or brads, to make the devices more lethal. A battery pack typically used on toy cars and a circuit board were also recovered. 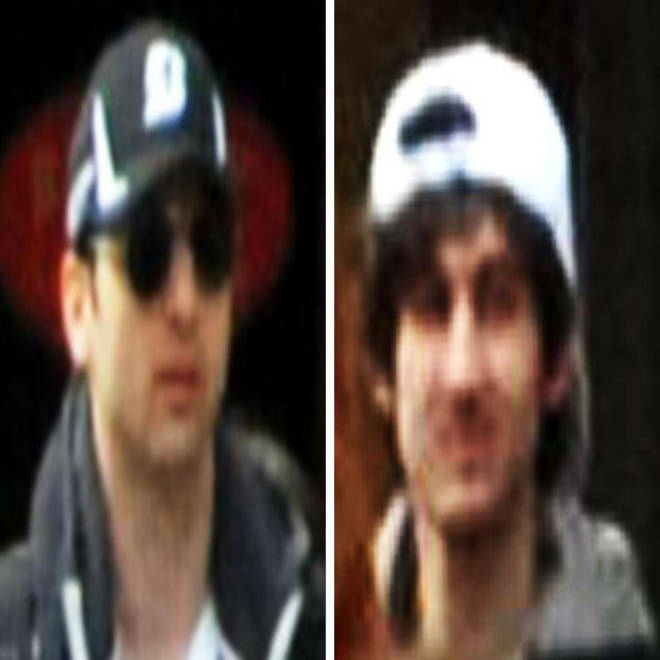 The FBI is looking for these two men, identified as suspects in the Boston Marathon bombing. But the videos are the biggest break in the case yet. They were unveiled hours after President Obama attended an interfaith prayer service to reassure both the injured and the city. As of Thursday morning, 56 patients were still being treated in hospitals. That was down from 65 on Wednesday. “In general, people are getting better, and we are happy with their progress,” Dr. Peter Burke, chief of trauma at Boston Medical Center, told reporters early Thursday. The three people killed in the attack were Lingzi Lu, a Boston University graduate student; 8-year-old Martin Richard of Boston; and 29-year-old Krystle Campbell of Medford, a Boston suburb. A trauma surgeon said that doctors have pulled fragments as large as 2 inches, including pieces of wood, concrete and plastic, from the bodies of the injured, in addition to metal shrapnel from the bombs. NBC News’ John Bailey, Richard Esposito and Michael Isikoff contributed to this report. NBC's Brian Williams and Pete Williams report on the FBI's release of images of two suspects in the Boston Marathon bombing.